It’s not because of Starbucks…although their Salted Caramel Mocha does make a good case for itself. It’s not because of scarves. Because no matter how many times I pin it, I still don’t actually believe there are 12 ways to tie a scarf cause they all turn out the same when I do it. I just get frustrated and give up. It’s not because of the boots. Okay, I love boots – but I love looking at them in stores more than I actually love buying and wearing them. I’d rather a fancy pair of heels any day…I know, totally going against the grain here. What I CAN (and do) get behind in the Fall are the colors (reds, yellows, jewel tones! ), the smells (cinnamon, fires, pumpkin!) and the flavors (all of them! )…and yes, smells and flavors are TWO DIFFERENT THINGS! Well here, we’re all about the flavors. Enter a delicious side salad that screams Fall. 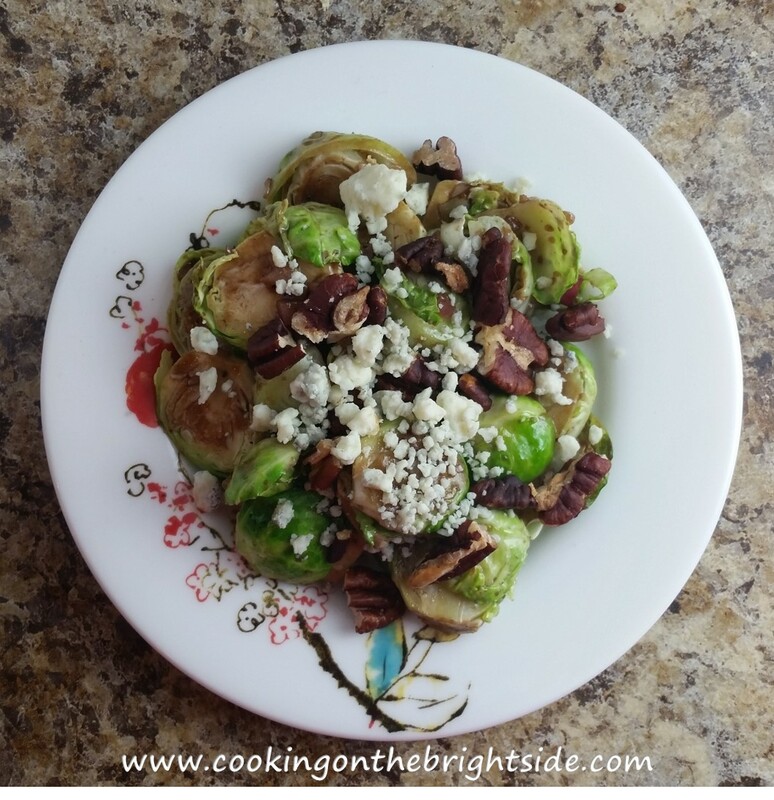 Roasted brussels sprouts? Toasted pecans? Bring it on! Whisk together shallot, olive oil, mustard, vinegar, garlic, salt and pepper. Refrigerate until ready to use. Heat oven to 350. Thinly slice sprouts and arrange on a baking sheet. Spray with olive oil and sprinkle with salt. Arrange pecans on baking sheet. Bake (both) for 5 minutes to soften sprouts and toast pecans. 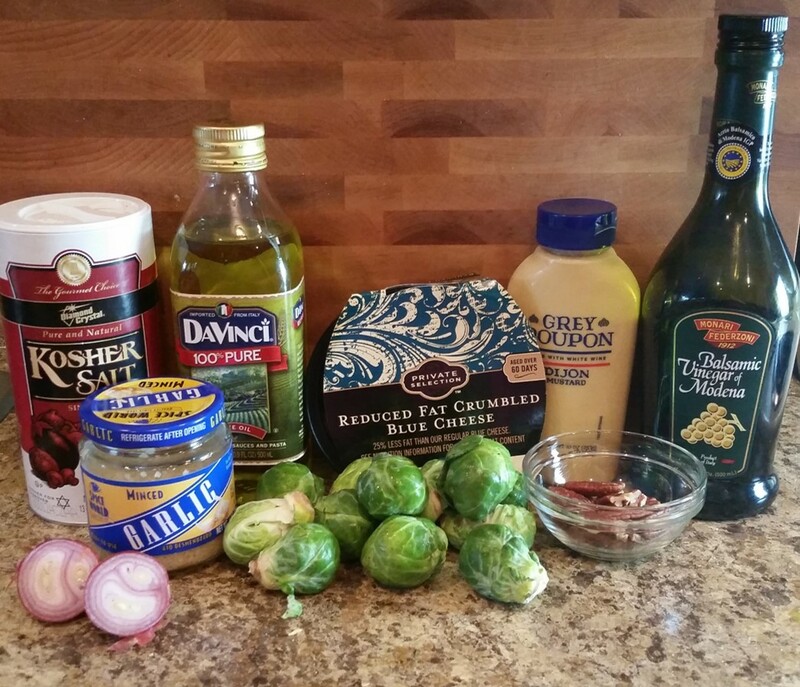 Add sprouts to a small bowl and drizzle with dressing, stir to coat. Divide and top with 1 Tbsp. 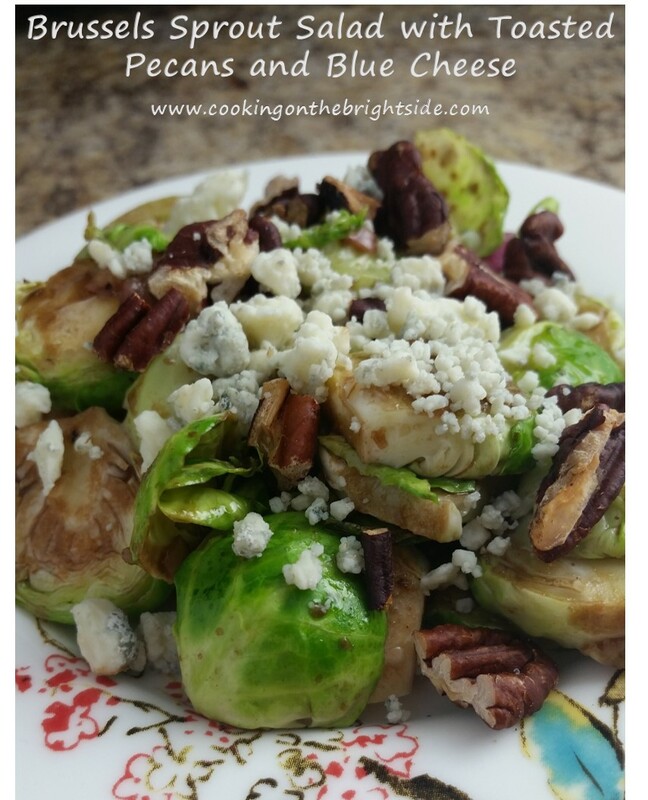 each pecans and blue cheese. Note that this is a small portion to be enjoyed as a side. We enjoyed it with some Orange Mustard Glazed Pork Chops and green beans for a delicious meal. I’m pretty sure red wine was involved as well, so there’s that. On that note, hope y’all have a great weekend!